Young Shing Machinery Co. Ltd.
1. Suitable for mixing different materials with similar grain and density. 2. Designed for drying up water existed on surface of materials. 3. A drying mixer suitable for water-ring pellet cut, under-water pelletizing and plastic waste recycling in extruding process. 4. A multi-function machine provides hot-air drying, contact heat transfer drying and mixing functions. 5. 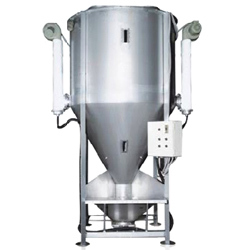 Range of drying mixing weight: 500~3000kgs (custom weight is available). 1. Capacity: 1680 litters. 2. Mixing weight: 1000kgs. 3. Motor (bower): 5HP (1/2HP x 2) or (1/2HP x 4). 4. Elec. heater: 16Kw (28Kw). 5. Machine dimensions (L x W x H): 1280 mm x 990 mm x 2240 mm.